Thread: I'm living on Maatsuyker Island, Tasmania, for 6 months. It's just the two of us! 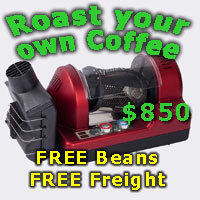 I am a long-time member and began roasting when the Behmors first sold here on beanbay! Anyway, I was writing to Andy (site owner) this morning and saying thanks for the 8-9kg of coffee we bought for our trip! I attached the blog link and he suggested posting it up here for anyone interested to read! My partner and I are living on a remote island off the south-west coast of Tasmania for 6 months. The island is home to australiast most southerly lighthouse, we are constantly buffeted by gales. Strongest wind for us so far is 70 knots (130kmh). It has reached over 200kmh as an australian record. No mobile reception, no tv and only recently installed nbn satellite for comms! We are employed as weather observers and we are also on the island as volunteer caretakers. The Island is home to 3 full size houses, a lighthouse and a host of other outbuildings. We are responsible for maintenance of everything (mowing, repairs, vegetable garden, de-moulding, drain clearing etc). To get here it's a helicopter flight for 50minutes, or a 4.5 hour boat trip. We had to bring everything we needed for 6 months (food, bedding, clothes etc), and we had a weight limit as everything is brought in via helicopter sling load. I wanted to bring the coffee roaster but we are on solar power out here! and backup generator! So no chance of that! Or, ask questions here! We are out working most of the day, I will reply when I can! Brewster, Dimal, GrahamK and 4 others like this. Hey Jesse, that's awesome! I really wanted to apply myself, but my significant other was worried that she didn't have the requisite experience (and just maybe a little at the prospect of six months together at the edge of the world ). Will follow your updates with interest. That sounds amazing and will be an amazing 6 months I am sure. Coming back to civilisation at the end of it all will be a rude shock I am sure. I remember listening to a breakfast interview on ABC with a previous tenant. Sounds awesome. Good luck. Shewey: Thanks mate, us too! We were pedantic with measuring everything (spreadsheet) so we should be ok! One resupply at 3 months in too! Noonar: The previous caretakers are all really cool, there is a great supportive network between all of them as well as the "friends of maatsuyker island" group which are amazing! They deal with historical/flora/fauna issues and have completed a massive amount of work on the island as volunteers! My partner and I have also interviewed on ABC hobart for a brief 10 minute stint a few weeks ago! It will be on our blog soon! The old photo shows what the island looked like in the 1900s, it looks the same now minus a few building missing! The boat dock and haulage no longer exist also! ...and I can see Andy's CS bags in the pantry shot at the bottom of the story! Great choice. We all joke about what we would take if we were stranded on a desert island, these two are actually doing it. It's an awesome blog, one of the best I've ever read. Wow thanks for the kind words guys! We both write the blog, Taylor is an amazing writer! I'm alright :P I have another piece in progress and so does Tay! It is a little hard to see some of the other stuff we bought. Full excel spreadsheet to come on our blog! We got all the meat, dairy and seeds for vegetable garden in Tassie. So that's not pictured. The vegetable garden here is large and has two Poly houses. Just did a resupply list for our 3 month coming up late November! It was tricky, assessing what we have used in 2 months (just over) and imagining what it will look like with 4 months to go was daunting! If we get it wrong we will be eating the heritage planted potatoes from old lighthouse keepers and the native coastal spinach haha! The pantry shot still looks to me like it's not enough, but it's amazing what 25kg of rice, 32kg flour as staples can get you! Plus 91kg of meat! Coffee was definitely the priority for us! Expect another order from us soon! And thanks! Alcohol wise we have a home brewery, our IPA was just tasted at 3 weeks post brewing... Amazing! We also have gin, wine casks x2 as well as the whiskey. And 1 x Baileys for those cold nights!! We didn't actually realise that ABC article was going to be written, it was based off a short radio interview we did the same day and then it blew up a little! Thanks for reading and commenting! What this journey has so far proved to us it that anyone can do it if they want to! It's a learning experience every day for us! Unfortunately no coffee roasting on the island due to power system limitations! I REALLY did consider bringing the Behmor over, but there was also the weight factor. Plus it would have needed Parks test and tag (Electrical) I'm sure. I might do some in a pan on the BBQ and claim "Australias most southerly coffee roast"! Thanks 338! I really liked Taylors post too, very emotive. We both loved that Currawong. I think it struck a chord with a few people. Funny how you immerse yourself in your surroundings so quickly too. P.S Just realised we probably wont get Andys coffee in time, have to order resupply today and get it here by Friday. That's my bad! I love everything about this. This post, the blog, you both! It makes me miss home so much, and be extra grateful for everything we have on our current posting. Taylor's post about her Oma and Charles was so beautiful, please pass on my condolences (and then tell her that her writing is very excellent indeed). Thanks Tashie! Sounds like you are far from home too! And thanks for the kind words on Taylors post, I passed that on. She's a great writer! (Writing this from the Weather observers building at 0900). Currently watching the lead yacht in the Melbourne to Hobart race come into view at South West Cape! To our surprise there is nothing in the media about this race! It's all about the Sydney to Hobart, It seems like the Melbourne to Hobart is much more extreme as yachts come down the West coast of Tasmania, sail under Maatsuyker Island then onwards to Hobart! Lead yacht is currently "Spirit of Downunder". Approx 25km West of Maatsuyker Island at 11:15AM 29/12/17. Fantastic thread anyway. Loving the photos and blog. Wow, I don't know where the last hour went. What a fascinating insight into another world! The writing wasn't just interesting content, but it was all really nicely written too... Keep up the great work! We are coming into our final month... don't want to leave! Love the life as hard as it can be. Earlier in the week the vehicle broke down, took us three days to figure out what was wrong (electrical), and it was stuck up the other end of the island! No RACV out here haha! The worst part was without reception I (we) had to walk the 1.5km each way to get back to use the Internet/phone! The amount of tools I forgot in those three days! Anyway, I will miss that sort of thing. We have just finished building a bench which was made from scrap everything, down to pretty much poor quality lumber here now, though we did utilise scrap galvanised pipe and copper. We will make a video and put on our Instagram soonish. busy busy! Thanks for reading! My partner and I have moved from Maatsuyker Island to Three Hummock Island (TAS North-West). It's much much bigger, has a few airstrips and we manage the occasionally occupied accommodation. Still just the two of us! It also has much more work, ageing infrastructure etc. Blog post to come. flynnaus, Magic_Matt and WhatEverBeansNecessary like this. Congrats. Sounds like you are turning into professional island sitters. Do you get a boat or an opportunity to return to the Tassie mainland as needs require? Thanks! Yeah we like the life and got lucky! It's hard work though. We got a boat out but the jetty is closed for anything other than management use (bringing in gas/diesel etc). The island has a few airstrips, we get one resupply every 3 months. It's a short flight in a 2 or 3 seater plane to Tasmanian mainland. We are in the process of updating the website, it hasn't being done in 10 years! PS. Time to build a gas coffee roaster. got all the scrap i need here and a welder etc. Last edited by B00sting; 25th April 2018 at 05:21 PM. flynnaus, Magic_Matt and bigdaddy like this.